Its Lola B12 69/EV vehicle hit a top speed of 204.2mph (328.6km/h) at a racetrack at RAF Elvington in Yorkshire. Chief executive Lord Drayson, who was behind the wheel, said the achievement was designed to highlight electronic vehicle technology's potential. The previous 175mph record was set by Battery Box General Electric in 1974. Drayson Racing is not the only electric vehicle-maker hoping to use motorsport to spur on adoption of the technology. Last week Nissan unveiled the Zeod RC (Zero Emission On Demand Racing Car), which can switch between electric and petrol power. The firm intends to enter the vehicle into next year's Le Mans 24 race saying the competition would act as a "challenging test bed" for technologies that could eventually find their way into road cars. 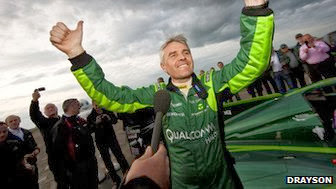 Drayson Racing was founded in 2007 by self-declared "car nut" Paul Drayson, who was then a minister in the Labour government. The firm, based in Kidlington, Oxfordshire, works with others to develop more sustainable automotive technologies and uses motorsport competitions as a means to focus its efforts. In order to qualify for an attempt on the Federation Internationale de l'Automobile's (FIA) world electric land speed record it had to make its vehicle weigh less than 1,000kg (2,204lb) without the driver. To do this it adapted a Le Mans Series car it had previously designed which originally had a bio-ethanol fuel engine and replaced the part with a lightweight 20 kilowatt hour battery offering 850 horsepower. It also adapted the vehicle's chassis, which is made out of recycled carbon fibre, to minimise air friction. "What it, I hope, shows to people is just what the future potential of electric cars is," Lord Drayson told the BBC shortly after his record-breaking time was confirmed. "Obviously this is a very special racing car, but by setting this new world record here in Britain we say two things. "One it is a pointer to the future - the technology that we developed for this car will filter down to the cars we use every day. "And secondly it's a message about how here in the UK we're a world leader with this technology. We've led motorsport engineering, now we're also leading with electric motorsport engineering." Google's chairman Eric Schmidt spent two hours at the race track watching practice runs but was not able to stay for the record-setting drive. "Google has a very active R&D programme with regard to electric vehicle technology so it's great that one of the world's leading technology companies came to our event today," Lord Drayson added. "It was lovely meeting him."